Year Built: 1922 "with 1967 addition"
This incredible commercial property is ideally located at 307 Main Street in Rosetown, Sk. With approx. 3,400 SqFt of total space, it offers a tremendous opportunity for any retail business. The 2,420 SqF retail area features an open interior with built-in lit display shelving along the walls and street front window display ideally set up to showcase any line of products. The front entrance is built-in as to maximize security and reduce heat loss. An office, staff room, and restroom are located off to the side of the retail area. The 2 areas located at the back of the building (approx. 980 SqFt.) are well suited for inventory processing and storage. There are 3 stalls for employee parking at the rear of the lot. - 1,585 SqFt addition built in 1967. - sloped roof, refinished in 2014. - 2 natural gas forced air furnaces: one in basement for the retail area, one in storage area for the rear part of the building. 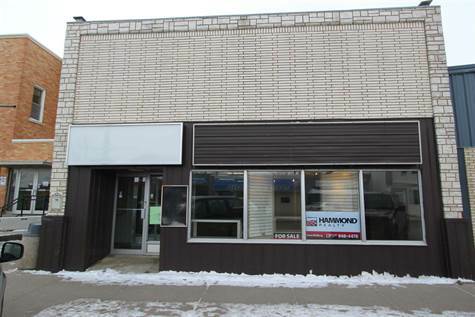 Don’t miss this opportunity to own some of Rosetown’s finest retail space.